Lieutenant Thomas Selfridge, an official observer of the United States government who came into the association upon Bell’s special request to President Theodore Roosevelt. The association lasted for 18 months and in that space of time constructed a glider and 4 aircraft. The success of the organization can be directly attributed to Dr. Bell and his goal orientated management style. Bell’s Boys, as they were called, were able to innovate. Everyone was responsible for developing a project while the rest of the team helped out. The successful components were retained for the next project/endeavor and eventually incorporated in the development of a new flying machine. Dr. Bell thus performed the senior CEO who not only oversaw, but also encouraged every member of the team while controlling their youthful exuberance. 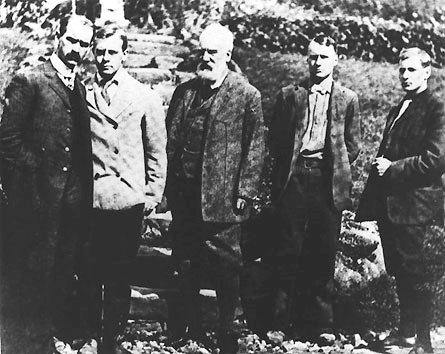 Bell had met Curtiss in 1905 and soon after they started conducting experiments with tetrahedral kites, four-sided, lightweight aluminum frames covered with silk. Bell was anxious to attach one of the Curtiss motors to it as part of his studies in aerodynamic lift, propulsion and control. Once McCurdy and Baldwin came aboard in 1907, the group started developing prototypes, the first being an enormous kite made of more than 3,300 red-silk tetrahedral cells on pontoons. 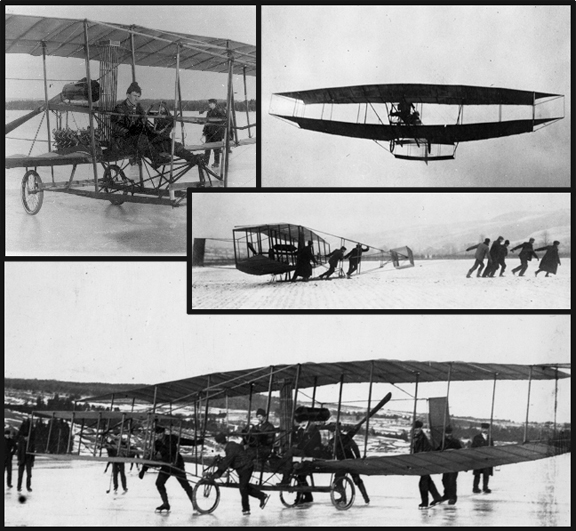 Following its crash on 6 December 1907, Bell decided to include biplane designs in his experiments. This resulted in a glider with a Curtiss engine attached to it. Baldwin flew the new prototype in Hammondsport, New York, in March 1908; henceforth he claimed to be the first Canadian and British subject to pilot a heavier-than-the-air powered machine. With this third prototype, Bell introduced the movable wing tips or “ailerons” which helped in maintaining direction and balance of the plane while flying. It flew for another 150 times without crashing, but it was the Silver Dart prototype that entered the Canadian records book, with J.A.D. McCurdy as chief designer and pilot. The first powered flight on Canadian soil took place in Nova Scotia, on 23 February 1909 when J.A.D. McCurdy flew the Silver Dart aircraft over the ice of Baddeck Bay in 48 seconds, for a distance of 800 m and at 9 m altitude. For this performance, McCurdy was officially recognized as the first British subject ever to fly in the Empire.